When a person is arrested, there are two options to get released. Pay 10% for a Bondsman to post a Bail Bond or Pay the full amount in Cash for a Cash Bond at the Jail. 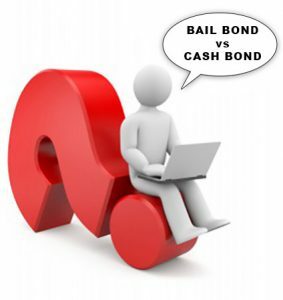 Now you are asking, Why should I pay a bondsman 10% if I have all the cash to put up for the bond? It used to be that all the money from the Cash Bond was returned to the depositor when the case was closed. But the Florida Legislators changed the laws allowing the court costs, fine and fees to be taken from the money deposited with the jail. A Cash Bond is when the Defendant or his family/friend posts the full amount of the bond to the Court through the Sheriff's Office. When the defendant appears for all of his/her court appearances, they are eligible to get the money back. BUT READ THE SMALL PRINT ON THE CASH BOND. The court takes out any court costs, fines, fees, and any monies owed for this case or any previous cases that have a balance is outstanding. IF there is any cash left it will be returned to the person who posted it. IF the Defendant Fails to Appear. The cash bond is forfeited to the court! With a Bail Bondsman you pay a 10% premium to get the defendant released. A Bail Bond is a contract that the signer will ensure that the will Defendant appearing at all court hearings.